A Fuji Rock do or don’t? We’ll let you decide! How goes it my fellow Fuji Rockers? I’m sure I don’t have to tell you, we’re closing in on one month to go before the yearly extravaganza in Naeba. So, whether this is your first dance or your twentieth, it’s never a bad idea to be reminded of some of the things that will help you make the most of our beloved, mountainous, musical marathon. Do – Stay hydrated. 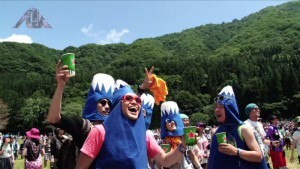 Fuji Rock is a long, grueling 3-day and night party. In order to enjoy the most of it, you’re going to want to take in plenty of water and electrolyte drinks. Especially when the summer sun is beating down, don’t forget to replenish those lost fluids. Don’t – Drink too much alcohol during the day (I’ll give you a pass once the sun goes down). Remember, festivals are a marathon, not a sprint. Enjoy the music, that’s why you came to Niigata and spent all that money on tickets and accommodation. You can get drunk and pass out in a ditch back home, it’s a bit of a waste to do it at Fuji Rock. Do – Eat well and often. The healthy and delicious options for sustenance at Fuji Rock is a thing to behold. Don’t – Skip meals or eat too much junk food. If you want to rock and roll all night and party everyday, give your body the proper energy to do so. Do – Bring a raincoat, boots and light clothes that you can change out of. It’s going to rain at some point during Fuji Rock this year, however there’s no need to let that put a damper on your Fuji Rock experience. A little planning ahead goes a long way. Don’t – Forget your sunscreen. As sure as it will rain, also plan for a healthy dose of summer heat and sunshine. What’s worse than being damp and uncomfortable throughout a festival? Being sunburned and blistering, while being damp and uncomfortable, that’s what. Don’t – Stress over trying to see everything. If your musical tastes are as diverse as mine, there’s bound to be plenty of crossover in your daily schedule. Try to embrace the idea that you won’t be able to see every desired act and that you will inevitably miss some great performances throughout the weekend. You will enjoy the acts you do see all the more once you do this. Do – Make a point of seeing at least one headlining performance in full. Give yourself ample buffer time before and after the set and sacrifice all else to soak it all in. The headliners are world class for a reason and a good chunk of your ticket price goes to pay these guys. At least once throughout your weekend, see what the hype is about. Do – Take cash. Take more than you might expect to use, just in case (maybe stashed in different places also). Up until a couple years ago, there were no ATMs at the festival, at all. Japan is a cash based society and Fuji Rock is no different. So while you may spot a couple ATMs this year, probably near the festival entrance, expect long lines and limited access. Don’t miss out on that limited edition Post Malone hoodie or be forced to starve on the final day because of a lack of funds. Don’t – Bring valuables. While I know most of you are responsible, party-in-moderation people, Fuji Rock does tend to get messy, both literally and figuratively. Think twice before you bring that new iPad and maybe leave your iced out Jesus piece at home this time. Do – Arrive early to pitch your tent. The camping area is vast, but all the best spots get picked over fairly early. So, unless you want your tent perched half way up the mountain or crammed in literally centimeters from your neighbor, arrive early and stake out your spot. You wont regret it. Don’t – Forget where you pitched said tent. You may have arrived early and found the perfect spot for your tent but if can’t find it, stumbling back at 2 am in the darkness, it will all be for naught. Make your tent stand out from the rest so you’ll recognize it. Put some flags, a banner or some reflective stickers on it so you’ll spot it in time of need. Do – Keep Fuji Rock clean. If you’ve been to Fuji Rock before you’ll know how clean and orderly this festival is compared to festivals around the world. Bring a garbage bag to your camp site, bring a portable ashtray if smoking, and please heed my next piece of advice. Don’t – Litter or leave your tent behind. Even when the festival is over, take the extra time to throw out your unwanted remains. On the Monday morning, there’s always big dumpsters and volunteers helping to sort out trash near the festival entrance. Don’t be that person to make the fine folks of Naeba sorry they hosted Fuji Rock on its 20th anniversary of Fuji at Naeba. Do you have any more essential Fuji Rock Do’s and Don’ts for us? Let us know in the comments section below. Seeya in a month!